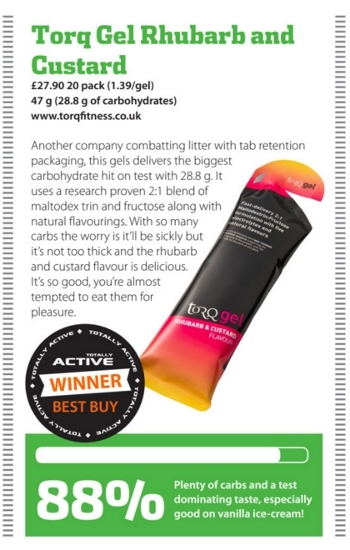 This month’s Totally Active Magazine reviewed 5 energy gels, including our very own Rhubarb and Custard Flavour, which came away as the test winner. The test concluded that our gel was the Best Buy with a total mark of 88%. The review concluded that our gel had “Plenty of carbs and a test dominating taste, especially good on vanilla ice cream”. For the full review, check out the December issue of Totally Active Magazine by clicking here and scrolling to Page 28. For more information on TORQ Gels, click here.